Welcom to That Dam Run & Crush That Dam! The Best Dam Run you will ever do! 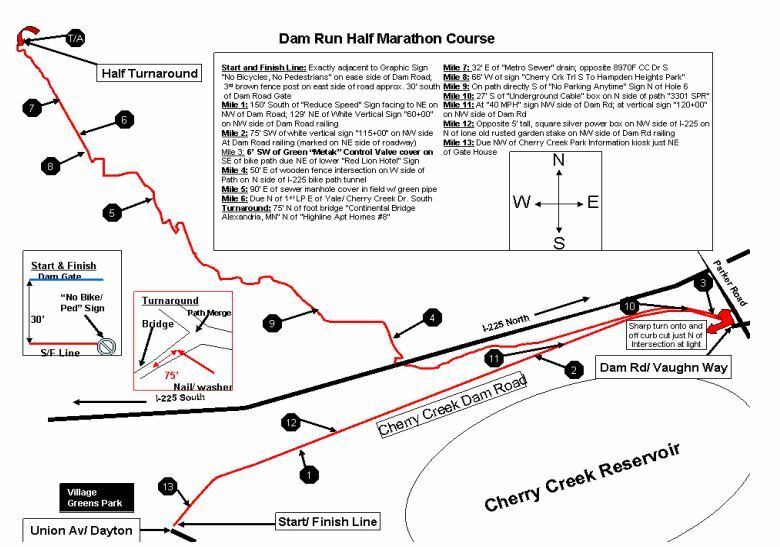 Come Crush that Dam and run either the 13.1 (Half Marathon), 10K, or 5K. Come CRUSH THAT DAM, have fun & enjoy with your family, friends & loved ones. The starting line is Cherry Creek Dam Road & S. Dayton St.
Advance pick-up at Road Runner Sports (8457 S. Yosemite St., Lone Tree, CO 80124) from 11am – 2pm on Saturday, March 2, 2019. Race day pick-up opens at 8:00 a.m. 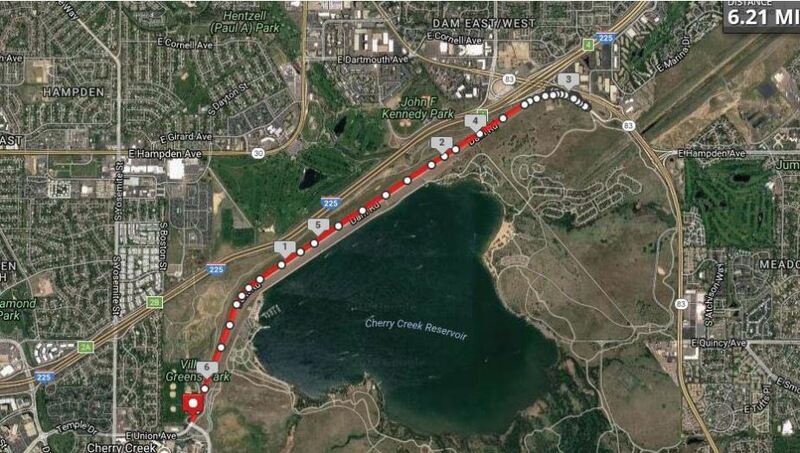 The event will take place at Cherry Creek Dam Road, Greenwood Village, CO, about half an hour's drive from downtown Denver and an hour and a half of the 83D or 83L bus. Interested in volunteering at That Dam Run? Super!!! Please head over to the That Dam Run website to volunteer. Please note, there is a 3 1/2 hour course limit, 16 minutes mile pace. We will have water available to all participants. For those in the 13.1, you will have water and sports drink available at aid stations past 1.5 miles. We will have a GU for you at the halfway point aid station. Top three (3) male and female in the following age groups: 12 and under, 13-19, 20-29, 30-39, 40-49, 50-59, 60-69, 70-79, 80 and over. Top three (3) overall male and female finishers (results will be verified by USATF officials). RunDenverSeries organizes great and fun races!! They make sure their races happen regardless of sun, rain, or snow. This event was very well planned. Course distance was pretty spot on to my garmin. I would definitely do this race again but in hopes for much warmer temps. It was -20 windchill and 0 degrees at the start line....7 degrees at the finish :). Overall, given the weather and conditions, it was a great race. My only disappointment was the wrongly marked course approximately 10ish miles in. While the course arrows pointed the opposite direction of the course, the top 20 or so went the wrong way and ended up running much too far. When we came back through, the arrow was facing the correct way so Im assuming a volunteer fixed it midrace. It wouldve been nice to have volunteers at key points directing the race. Again - given the weather, I cant imagine too many people wanted to stand in 0 degree temps for 3+ hours! Wow, these guys organized a great race and had a full support crew out there even though the temperature at the start was below zero Fahrenheit at the start, and the water was freezing in the cups at the aid stations. The tone of the race was great, it was a race by runners for runners. Although running across the dam is fun, it was a hard course mentally. First, the lowest point is at the turnaround and then for the last 3 miles on the dam you can see the finish line in the distance and it never feels like you are going to get there.All in all a great end of winter race! Great race. 1 degree above zero and a snowy running surface didnt make it fast but the organizers did a good job with the conditions they had to work with. 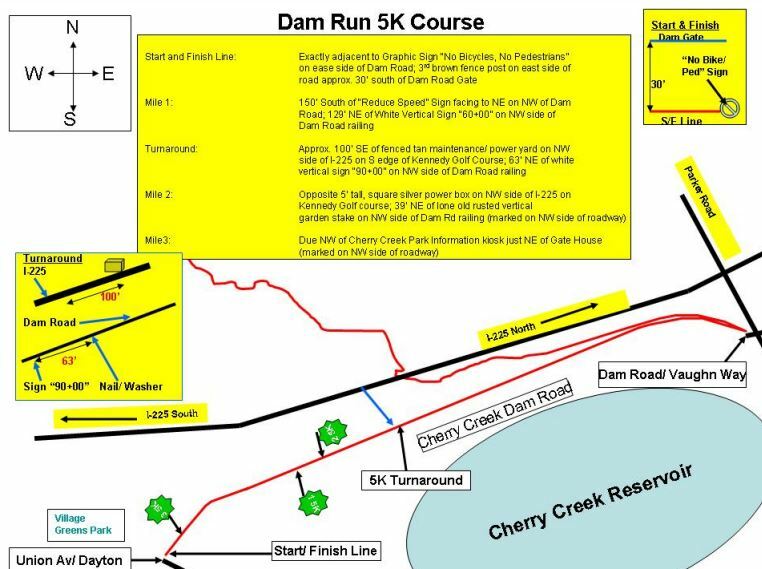 The dam is super flat so this is likely a very fast race if conditions are good.